John A. Martin & Associates, Inc. And the Winner Is…….. - John A. Martin & Associates, Inc.
JAMA was thrilled to learn that the structural design for “Agrifolia Major” won a Structural Engineers Association of Southern California (SEAOSC) Excellence in Structural Engineering (EISE) award! 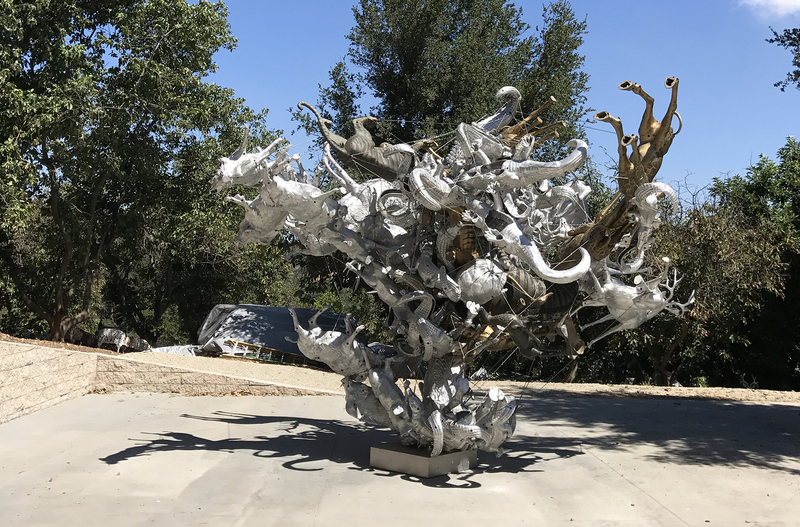 The project – a 14’-3” tall, 20’-9” long x 22’ wide sculpture by internationally acclaimed artist Nancy Rubins – utilizes a unique structural framework to allow the expression of multiple animals of cast iron, bronze, brass and aluminum. The animals are arranged in a balanced compression and ‘secured’ with tensile cables, but the engineering had to allow for a diverse set of weather conditions and loads, and its assembly / re-assembly accommodate transit and set-up anywhere on the across the globe that the piece may be shown or finally housed. Senior Project Manager Jaime Garcia and BIM Manager Felix Olmos accepted the award for this sculpture at the recent SEAOSC awards dinner. We’re awaiting news whether the project has also won at the State level.